January is a great month to cook some warming freezer fillers – which you can simply reheat on a cold night and indulge in pure comfort food. 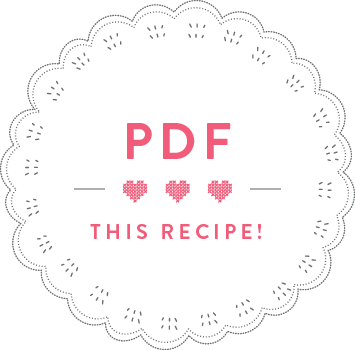 I typically make a big batch of pasta sauce in January, some warming soups and at least one or two curries and spiced stews. 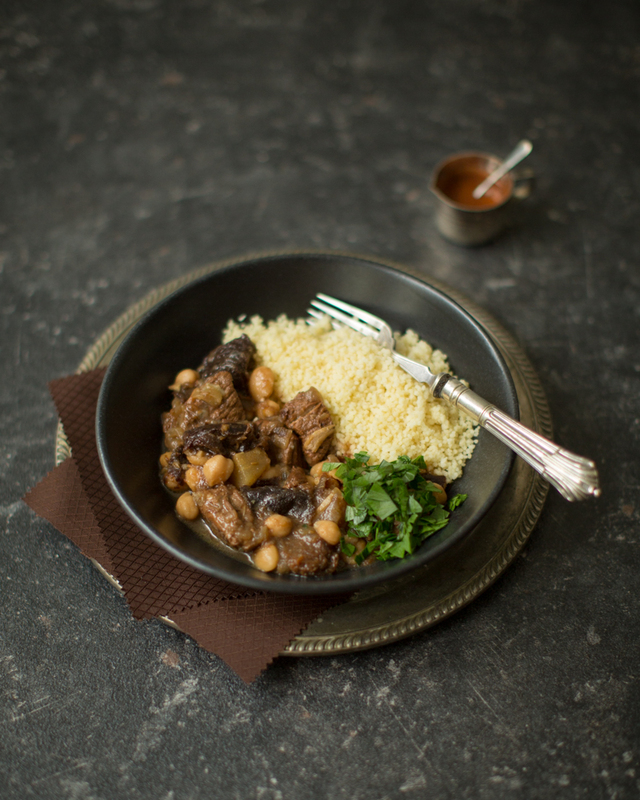 This Algerian lamb stew is such a fragrant dish that freezes beautifully and that tastes even better when reheated, as all the spices have had their time to infuse. 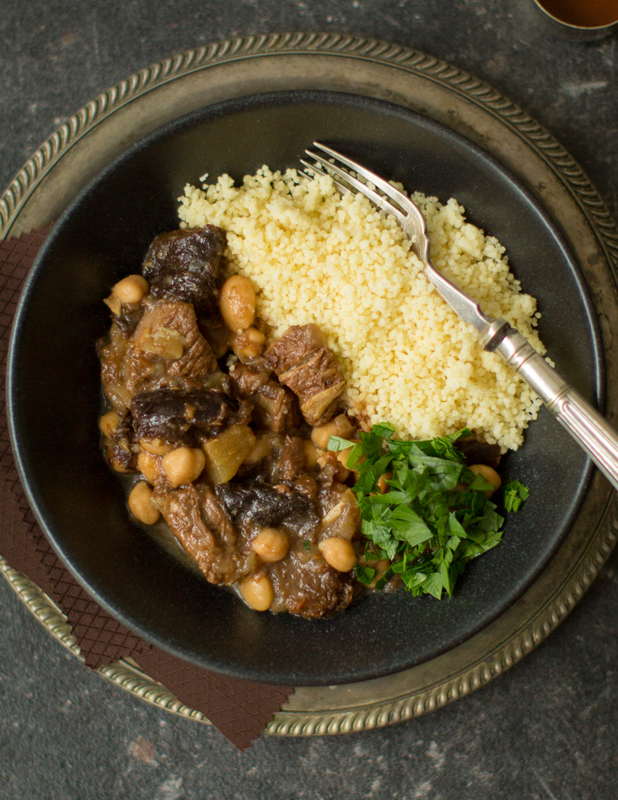 A beautiful meat stew with warming spices and sweetness from prunes and pears. Lovely! Put the prunes into a bowl with the orange juice and set aside while you prepare the rest. Peel and slice the onions and set aside. Peel and finely slice the garlic cloves. Melt the butter in a heavy-based saucepan and fry the onions with the garlic, cinnamon stick, cumin seeds and a pinch of salt for 15 minutes until soft but not browned. Take out of the saucepan and set aside. Heat 1 tbsp vegetable oil in the same saucepan used for the onions and brown the meat in batches. Put all the meat back into the pan, add the onions, prunes, orange juice and 500ml water. Cover and bring to the boil. Reduce the heat and simmer for 1 hour. Peel the pears core and cut into bitesized chunks. After 1 hour, add the pears and the almonds to the stew, cover and cook for another 15 minutes. After 15 minutes, uncover, add the chickpeas and cook for another 15 minutes. Before serving, adjust the seasoning with a bit of orange blossom water (if using) and salt and pepper. Take a bit of the liquid out of the pan, put into a little bowl and mix with harissa to taste. 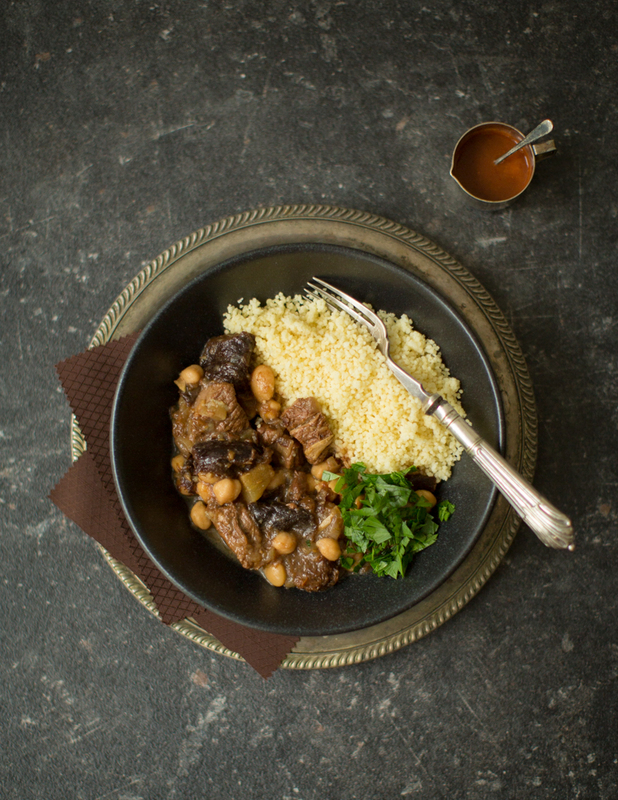 Serve each portion with couscous, sprinkled with chopped parsley and drizzled with the harissa sauce. *If you can’t get cut cubes of lamb, ask the butcher to debone a 2kg leg of lamb and cut into cubes of approx. 3cm – you’ll be left with roughly 1.6kg of meat. Leave some of the fat on, it will provide this stew with more depth of flavour.